When kids eat at least two servings of seafood each week, the benefits are big. 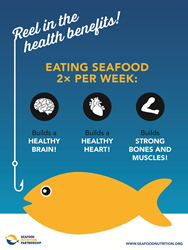 Fish and shellfish supply the nutrients essential for strong bones, brain development, and healthy immune and cardiovascular systems. As the new school year begins, the Seafood Nutrition Partnership (SNP) offers suggestions for helping your children do their best in the classroom and beyond. Kids, reel in the health beneifts with seafood! Brain Food: A third of the brain’s key functional units are made up of omega-3 fatty acids. A UCLA study shows that people who eat fish frequently have 14 percent larger brain hippocampus - the big memory and learning center. It’s especially important to eat the recommended amount of fish for moms during pregnancy and for infants through age 2 because this is the most rapid time of brain development. Better Sight Insight: While eating fish won’t lead to “X-ray vision” it can help with the healthy development of young eyes. Our eyes depend on omega-3s for their sensory function. Nearly half of our eye’s light detecting cell structure are made of omega-3s. Strong Bones: Just one serving of salmon provides 100% of daily recommended vitamin D.
Given the amount of data demonstrating the health benefits of seafood, it is surprising to learn that, according to the National Health and Nutrition Examination Survey (NHANES), only one in 10 Americans eat the twice-per-week amount of seafood recommended by the USDA/HHS Dietary Guidelines for Americans. Janine Faber, MEd, RD, LD, as a dietitian and a mother, works to debunk the myth that children won’t like seafood. She says there are three ways to increase your child’s interest in seafood: exposure, up to 12-15 tries before a child accepts any new food; be a positive role model, eating healthy foods yourself; and including kids in the kitchen to excite them about the dish they are about to eat. Learn more in her recent article, 3 Ways to Increase Your Child’s Interest in Seafood. Lighter Tastes: Start with milder white fish like Alaskan pollock or canned tuna, which can taste and look lighter than other oilier fish. Try mixing tuna with full-fat or reduced-fat plain Greek yogurt; the extra creaminess will make it taste less ‘fishy’ for a tuna fish sandwich—or dip served with tortilla chips. Watch a junior chef make a tasty pan white fish. It’s Burger Time: Like a crab cake, form a burger patty with chunks of cooked or canned salmon, along with grated cooked potatoes, chopped green onions and the ‘pizza herb’ dried oregano. View a step-by-step instruction video for salmon cakes. Add Crunch Appeal: Kids are sure to love fish sticks. They can be prepared quickly and in a healthy way right at home. This junior chef video offers a twist on fish sticks with a yogurt dill dipping sauce. Make Fish Familiar: Tacos are definitely kid-friendly. You can try shrimp or a white fish taco for your next meal. Add fat-free or low-fat cheese and sour cream—yummy! You’re simply adding it to a dish they already love! Check out this fish taco video.